485. A 10-year-old female presents with a 3 week history of cough. Initially she had a runny nose and was tired with a slight cough but as the runny nose resolved the cough seemed to get worse. She states that the cough is dry sounding and occurs during the day and night. She describes having coughing spasms that occasionally end in vomiting but between episodes of coughing she is fine. Her mom reports that during a coughing spasm she will gasp for air and sometimes make a “whooping” noise. A nasopharyngeal swab confirms a diagnosis of Bordatella pertussis. Which of the following is true? B. She should be started on azithromycin for more rapid resolution of cough. D. She will have lifelong natural immunity against Bordatella pertussis. 476. You are evaluating a 12 month old male patient for rhinorrhea and poor appetite. He is friendly and alert. His temperature today is 103.6 degrees Fahrenheit, and his examination is significant for clear nasal discharge and multiple small vesicles on the anterior tonsillar pillars and posterior palate. His examination is otherwise normal. He is accompanied by his mother who seems to be very concerned. The patient has been feeding well and all his developmental milestones have been timely so far. A complete blood count is normal. Which of the following is his most likely diagnosis? 12 month old male patient for rhinorrhea and poor appetite, temperature 103.6 F.
A 2-week-old infant is brought to the office for a regular postnatal follow-up. She was born after an uneventful term pregnancy to a 29-year-old G2P2 woman. Mother reports that the infant is feeding well and seems active. No evidence of any fever. The parents are worried about the ‘rash’ that appeared over the infant’s left cheek. On examination, a lesion is noted on the infant’s left cheek as shown below. Vital signs are within normal limits. What is the most appropriate next step in management of this finding? A 9-year-old boy is brought to the hospital with a wound to his left hand. He was in a fight with peer who bit him. His past medical history is unremarkable and he takes no medications. He has no known allergies. On examination, the child is crying. There is a 2-cm wound over the dorsum of his palm. What is the most appropriate course of action? A. Clean the wound and prescribe amoxicillin-clavulanate. B. Clean the wound and prescribe doxycycline. C. Clean the wound and prescribe ciprofloxacin. D. Clean the wound, close it with interrupted sutures and prescribe ciprofloxacin. E. Clean the wound, close it with interrupted sutures and prescribe amoxicillin-clavulanate. A 14-year-old girl with a history of Crohn’s disease presents with 2-day history of feeling ‘feverish’, malaise, lower abdominal pain and non-bloody diarrhea. She has about 10 episodes of diarrhea daily. She has had three similar episodes in the past 7 years. She denies any recent travel or sick contacts, rush, cough or other symptoms of infection. She has no known allergies and does not take any medications currently. She has been taking 5-ASA, but stopped 6 months ago as she had been asymptomatic for 10 months before that. On presentation, the patient is afebrile with a body temperature of 101.0 F and appears ill. Her blood pressure is 120/80 mmHg and heart rate of 90 beats/minute. Abdominal examination is remarkable for abdominal tenderness in the lower abdomen, but no rebound or guarding. A subsequent CT scan shows dilatation of the left colonic lumen, as well as a thickened colon wall with pericolic fat stranding, particularly in the left colon. The admitting team determines the patient’s presentation is due to exacerbation of her disease. The patient is started on 5-ASA, metronidazole and prednisone and her condition improves within 10 days when she is symptom-free. What is the most appropriate plan after her symptoms have resolved? 468) An 18-month-old girl is brought to the hospital by her parents because of a high fever and generalized “body shaking” 2 hours ago. The parents say that she was “pretty fussy” all day and her temperature at that time was 37.3 °C (99.2 °F). Over the past few hours, she began to “burn up,” with her temperature spiking to 39.7 °C (103.4 °F). They put her into her crib to go to sleep, and they heard “banging” coming from the baby monitor in their bedroom. When they arrived in her room 10 seconds later, her entire body was “shaking”. It lasted about 2 minutes, and did not recur. She was lethargic and drowsy for 5 minutes after the “shaking”. Nobody in the family has ever had a seizure before. Her temperature is 39.3 °C (102.8 F). Neurologic examination is unremarkable. A chest x-ray shows a left lower lobe consolidation. The parents are concerned about the severity of their daughter’s condition and what they can expect in the future. The most appropriate response is which of the following? 442 ) A 14 month old toddler is brought to your out-patient clinic by her concerned mother regarding a rash that appeared recently in her ano-genital region. The rash has appeared 3 weeks ago and is persistent. Mother says she tried to use local Zinc Oxide cream but it did not help. There is no history of fever. No vaginal discharge. She is otherwise healthy and reaching all her milestones appropriately. On examination, she is afebrile. 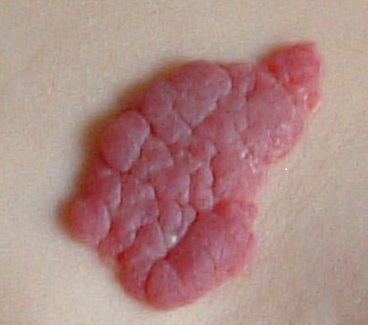 There are several papules seen in the ano-genital area as shown below.